Cardiology Associate Professor Raj Baljepally, MD, had to think quickly on his feet to modify a heart catheter during an emergent procedure for a patient in cardiogenic shock. His quick thinking led to successful replacement of an Impella device, and with permission from the device manufacturer, Cardiology Fellow Scott Cook, MD, worked with Dr. Baljepally to recreate the steps taken to modify the Impella device for possible presentation at upcoming national Cardiology conferences and potential publication. The patient case involved a 45-year-old man who presented with an acute ST-elevation myocardial infarction due to complete occlusion of his left anterior descending coronary artery. An Impella device was inserted due to low blood pressure and cardiogenic shock, which is a catheter-based pump designed to improve cardiac output and perfusion of blood to vital organs. The day after the primary procedure, the patient's blood pressure again dropped. An emergent echocardiogram showed the catheter had "kinked" and needed to be replaced. The design of the device did not allow for re-insertion of a guidewire to maintain vascular access. Dr. Baljepally's options were either to create a second arterial puncture, which increases risks for complications, especially since the patient was fully anticoagulated, or, as Dr. Baljepally chose, he could modify the device on the fly to maintain vascular access while removing the original catheter. 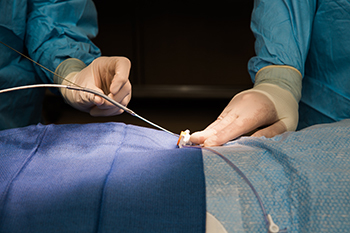 Using the UT Center for Advanced Medical Simulation, Dr. Baljepally and Dr. Cook re-created the procedure to outline the steps used to modify the Impella device. The resulting case report is already helping other interventional cardiologists when performing a necessary Impella exchange procedure. 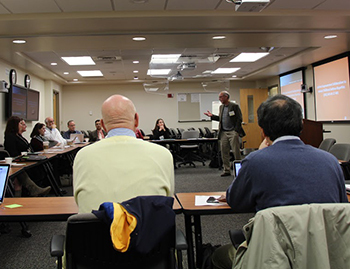 A group of clinicians, nurses, scientists, engineers, social scientists and community partners from statewide UT institutions participated in an interactive workshop to discuss a National Institutes for Health funding opportunity focused on reducing childhood asthma disparities. A group of 23 attendees from UT Health Science Center, UT Chattanooga, UT Institute of Agriculture, UT Graduate School of Medicine, and UT Knoxville spent the day sharing capabilities and trading ideas, and by the end of the day, they had a compelling story and a lot of enthusiasm to move forward with a grant submission. “This is truly an example of Team Science in action,” said Greg Heath, DHSc, MPH, Assistant Provost for Research and Engagement at UT Chattanooga. James Neutens, PhD, Dean, UTGSM, added that he could not recall such a multi-campus response around a single focused opportunity during his time in the UT system. According to the NIH website, the funding opportunity is to support clinical trials to evaluate Asthma Care Implementation Programs (ACIP) that provide comprehensive care for children at high risk of poor asthma outcomes. The community-based ACIPs are expected to address the needs of the U.S. community in which the study will be conducted and integrate interventions with demonstrated efficacy from four different sectors (medical care, family, home, and community). Applications must include a trial designed to assess if the ACIP improves asthma outcomes relative to an appropriate comparator(s) and a subsequent period of observation to evaluate sustainability. According to the Asthma and Allergy Foundation of America, asthma affects approximately 7.1 million children in America, which is about 8 percent of all children, and is considered one of the most common chronic medical conditions of childhood. A 2015 report by the AAFA listed Memphis, Knoxville and Chattanooga as 3 of the top 10 most challenging cities to live with asthma due to low air quality and cigarette smoke exposure. The health and economic impact of asthma is substantial, making it a target national health concern.